As a Young Woman, I didn’t know that some might consider being a Mormon feminist to be a contradiction. I grew up with many models of Mormon feminism. My mom, my dad’s mom, and the authors of the essays in Exponent II newspaper (now magazine) helped me know that I was not alone in my concerns about equality and gender in the Church. I grew up loving Judy Dushku’s Sister Speak column. Today, we have Facebook groups where we can immediately get answers to deep questions we don’t want to voice at Church or to our family because they can cause pain and tension, like how is the temple *really* for you? Or how do I leave the Church and maintain relationships with believing family members? But, in the 1980’s and 1990’s, those questions and answers would be devoured by many of us just once a quarter each year when our Exponent II newspaper arrived in the mail. I read Laurel Thatcher Ulrich’s and Emma Lou Thayne’s East/West column and thrived on their sometimes humorous, sometimes heartbreakingly familiar thoughts about faith and feminism. I read stories about women surviving sexual abuse, choosing to work, infertility, being single, and so many other experiences that helped me to gain empathy in way that I don’t think would have been possible without reading theses personal stories of women who were brave in their vulnerability. 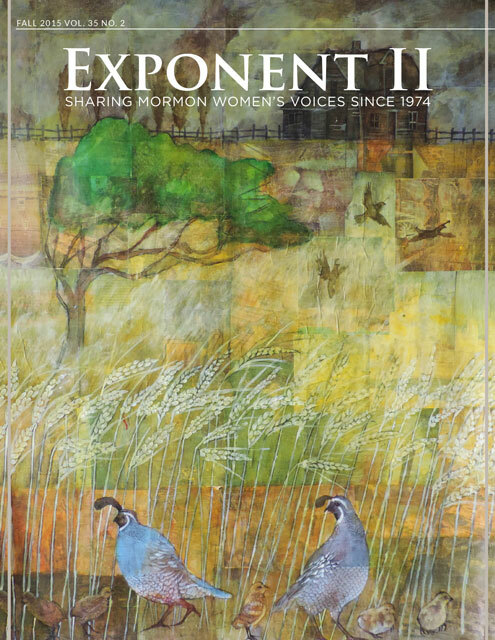 During my time as an editor of Exponent II, I had the privilege of working with my co-editor, Aimee Evans Hickman, to compile an issue devoted to the stories of the LGBTQ Mormons. It blew my world wide open to intersectional feminism. As a white feminist, I had been too narrow in my focus on gender equality, seeing it through my lens as a white cis-hetero middle-class women. Equality is the work of feminism for all who are marginalized, including queer, people of color, differently abled…for anyone who is overlooked or deemed “less than.” That is both the radical message of feminism (when we do it right) and of Jesus Christ. Every year, I give the gift of Exponent II to my immediate family, both my in-laws and my own. But, recently, I have come to value the Exponent II magazine all the more and expanded who receives this gift. Today, I feel like I need to immediately form an opinion on the topic-of-the-moment on social media. I don’t always sit with what I read, to reflect and ponder. So, for me, gifting a subscription is not just giving someone a beautiful piece of work. I am also giving the gift of time, of savoring something praiseworthy and of good report in quiet solitude. Sometimes, I give a subscription to a friend who is struggling, either with the trials of life or feeling unwelcome or uncomfortable her ward. I give it to ward members who have a hard time understanding me. (I have had a couple people thank me over the years for these subscriptions because it helps them see why I chose to define the Gospel as I do.) This magazine can help build bridges in a divisive time, which is why it is my favorite gift to give.